Rashad Al Musafir: The new platform, alongside the bank’s e-payment portal, will contribute towards enhancing retail trade and services in the Sultanate. 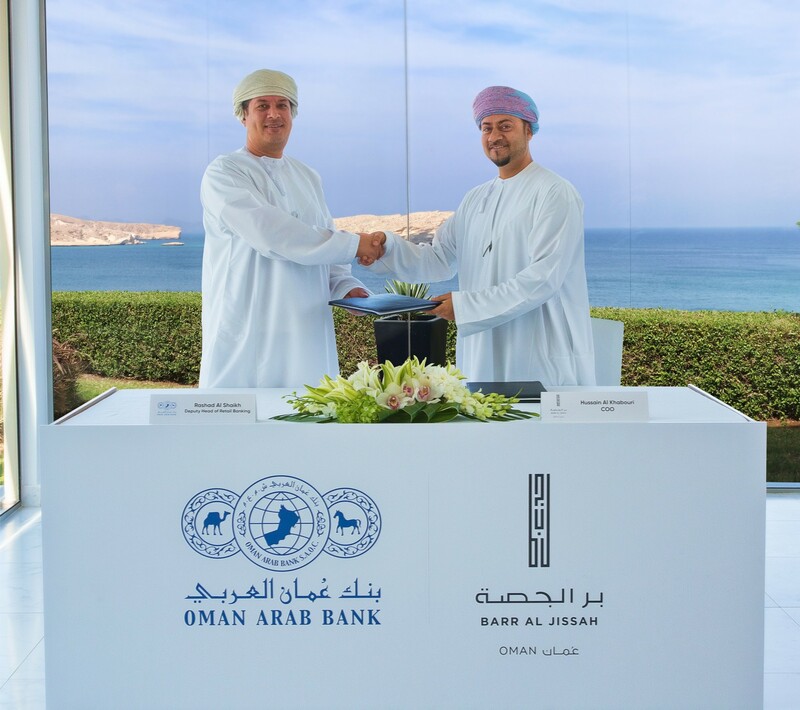 Muscat, February 13, 2018: Oman Arab Bank (OAB) and Thawani Technologies have recently entered into a partnership agreement under which OAB will function as the banking partner of the Thawani platform, an innovative e-payment solution. The signing ceremony saw the presence of Rashad Al Musafir, Acting CEO of OAB, representing the Bank, and Majid bin Fayil Al Amri, Founder and CEO of Thawani, representing Thawani Technologies. The agreement was signed at a press conference held at the Grand Millennium, Muscat; in which it was stated that OAB will act as the banking consultant for Thawani to ensure that the smart platform products comply with instructions set forth by the Central Bank of Oman (CBO) and other market authorities. Additionally, OAB will also work closely with them on matters relating to risk management and combating financial fraud, alongside the execution of all transactions via Thawani’s new e-payment app. OAB launched its e-payment gateway in late December in line of its future vision of the financial services’ sector, which is currently undergoing a rapid transformation towards a more digital economy. The Bank has been working to provide e-payments solutions that ensure transparency and convenience for all customers, with advanced levels of security and ease of use, that encourage them to carry out their business transactions through the Internet. Thawani Technologies launched its new e-payment platform ‘Thawani’ in May 2017 to become the first of its kind in the Sultanate. The platform featured an innovative design that ensured easy accessibility of its services for both businesses and consumers. The users need only carry out the initial setup and enter their financial data in order to start using the app and make or receive payments. As such, the platform has introduced the Sultanate to a new era of financial transactions, one that will facilitate easier and faster payments while reducing all probable risks. As for security, Rashad al Musafir asserted that the platform is set up in accordance with all CBO regulations as well as international PCI DSS and PA-DSS standards for data integrity and secure encryption. Al Amri also confirmed that Thawani, in collaboration with relevant departments at OAB, adopts very strict controls to ensure fraud protection, risks management, and anti-money laundering. Starting from March 13, the Thawani App will be made available on both Google Play and App Store for free. While using the App, customers will not only enjoy absolute convenience but will also be able to keep their banking data completely private. They will not be required to share any card, bank, or account information at any point during a transaction. In addition, with Thawani, customers need only scan the buyer’s QR code and enter the amount of payment required to complete the transfer process. If you are not present at the shop, you can instead use their supplied merchant ID or saved phone number to carry out the transaction. Alternatively, the merchant can send you a payment request via ‘WAYYAK’ on the app, which you can then approve to complete the transaction. In addition to the convenience it provides, the app also offers a wide range of other benefits including a new alternative for making bill payments. For businessmen and retail merchants, the new platform from Thawani and OAB will be far more useful than systems currently available on the market. In addition to the minimal fees required for using the platform, the time to complete a payment transaction is amongst fastest in the market, thanks to new technologies and programs developed by both Thawani and OAB. As such, the app will definitely reduce human errors and encourage staff to focus more on customer service rather than the financial process itself. For more information on Thawani go online to www.thawani.om or call +968 2456 5013, you can also follow the brand on its ‘ThawaniPay’ facebook page, on instagram at www.instagram.com/thawani_pay, or on twitter @Thawani_Pay.